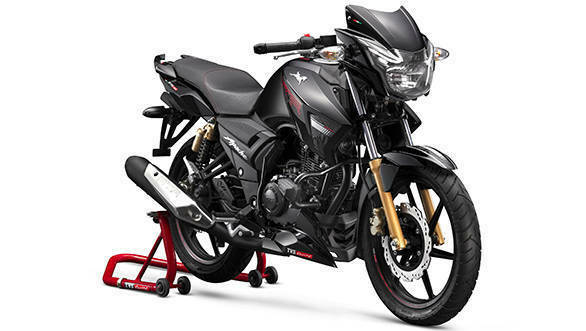 TVS motorcycles have updated the Apache RTR 160 2V, Apache RTR 160 4V and the Apache RTR 180 with supermoto ABS (anti-lock braking system). TVS claims that the supermoto ABS works on a specific algorithm and is derived from learnings from their racing history. Along with the addition of the supermoto ABS, the TVS Apache RTR 160 2V (ABS) is equipped with a new backlit speedometer with dial-art. The bike also gets new seats and new bar end dampers. TVS racing inspired graphics will also be on offer. The Apache RTR 200 4V, on the other hand, continues to be offered with a dual-channel ABS system with rear wheel lift-off protection. Commenting on this, KN Radhakrishnan, director and CEO, TVS Motor Company said, "Since inception; TVS Apache series has revolutionised performance biking by introducing cutting edge technology from their factory racing versions. In 2011, we were the 1st manufacturer to introduce twin channel ABS (Anti-lock Braking System) on Apache RTR 180, in the Indian two-wheeler industry. 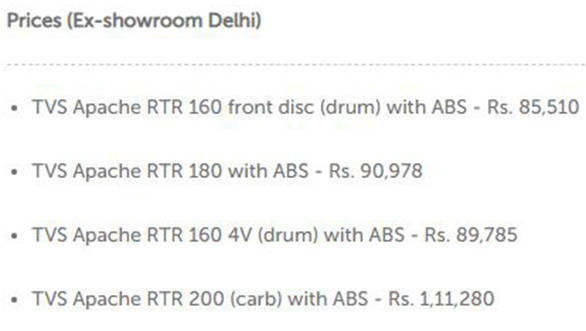 In line with this tradition, today, we are delighted to announce the inclusion of Super Moto ABS across RTR 160; RTR 160 4V and RTR 180 versions. This one of a kind racing tuned ABS technology that ensures maximum dynamic performance along with cutting edge safety technology to our consumers. The motorcycles are already on sale in the market to ensure proactive compliance to the regulatory requirement laid down by the Government of India."